Because a scarf is a large object, that requires stamina. You may not be ready for this if you’re still trying to find your way around stitches. Unless you use super chunky yarn, you may start feeling discouraged that you have nothing recognisable and wearable after hours of work. I would advise you to start with playing around with practice samples, not making anything in particular, just getting familiar with the stitches and finding your ideal working position and rhythm. Then choose something quick and small as your first project: a facepad, a coaster, a hairband, a decorative little thing that will make you smile. Something you can manage in a weekend, so that you can start the following week with a great sense of achievement, telling yourself and others “I can crochet! Look what I made!” while having a little dance. Truly master the pattern of your first project, know it inside out and back to front, understand it fully (no allowances for luck in having ended up with the right number of stitches at the end of each row), then pick something a little bigger – NOT a bit more complicated. 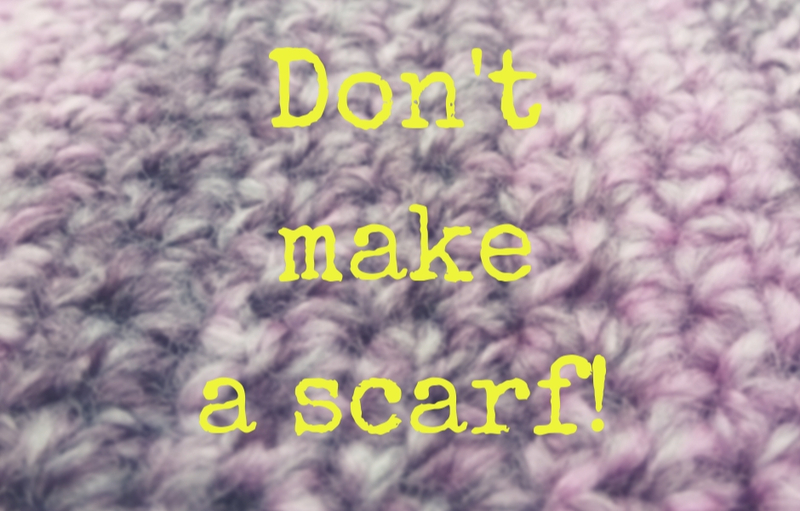 By all means, make a scarf now! See how you feel spending more time making one single item. You can then decide what to do next: continue making bigger yet simple things, or look for increased complexity while sticking to small items. If you managed to get a larger/harder project finished without getting distracted and starting another one, well done! If you didn’t, don’t be hard on yourself – it’s a perfectly normal behaviour, shared by many yarn lovers. Never beat yourself up if you get bored with a project and want to give it up. Life is too short to crochet things that we don’t enjoy making! Just make sure that you pick something more manageable (shorter/simpler) as your new project. Yarn does not have an expiry date, so just make sure to keep all the project materials and info in a closed bag or box, that you could label “PhDs” (Projects Half Done) or “UFOs” (UnFinished Objects), and stop thinking about it for a while. Who knows, in a few months/years, you may feel like resuming your abandoned project!